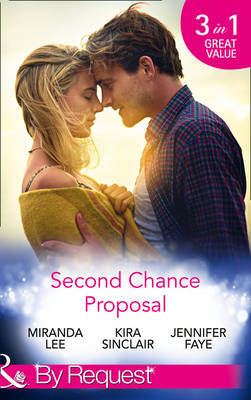 Second Chance Proposal A Man without Mercy by Miranda Lee Wealthy property developer Jack Stone offers recently heartbroken Vivienne Swan an offer she can't refuse. Vivienne has finally moved on from her ex, but now she's engrossed with her new boss. Vivienne wants to play with fire, but is she prepared to get burned? Bring it On by Kira Sinclaire Lena Fuller has fled her ruined wedding, only to end up on her honeymoon with her best friend, filmmaker Colt Douglas. The "honeymoon" is a week long photo shoot and quickly the lines of friendship slip and the couple aren't faking it any longer. Where will they be when the week is up...Rancher to the Rescue by Jennifer Faye Celebrity chef, Meghan needs a place to lie low after being jilted at the altar. Fleeing the press, she runs into the chiselled chest of rancher, Cash Sullivan. Cash offers her a place to hide and Meghan accepts. Slowly falling for the rancher, Meghan doesn't want to leave but she can't stay here forever carrying another man's baby, can she?